What is the right thing to do in the face of anti-social behaviour? It's a question being asked after the deaths of a number of people who decided to step in to stop what they saw as troublemakers. 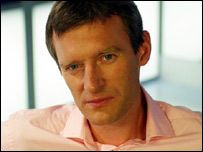 Here broadcaster Jeremy Vine explains why for him, sitting back is no longer an option. I was sitting in a Tube carriage next to an attractive young woman who was reading a magazine. There was a guy sitting opposite me, who was kind of Neanderthal. He had obviously taken an interest in this woman. "Hello darlin', give us a smile! Come on darlin'! It's not that bad is it?" That was just annoying. But then he leant forwards and he started tapping her knee. And she kind of shrank back into her seat. I kind of 'tutted' and lifted my magazine even higher. That was my initial move. Anyway, all the passengers on the Tube were aware of this. The Tube stops. He gets out of the doors - the thug. He walks off down the platform, we're all quite happy he's gone. Another passenger flips him a V-sign. The doors have closed, by the way, when he does this. And then the disaster happens - the doors reopen. The thug runs back in. He's six foot three, his muscles are so big they're flexing against the Tube glass, and he just starts beating seven bells out of this fellow. And actually when you see physical violence or are on the receiving end of it, it's very very nasty. His fist went into the side of his head, blood came out, another fist, the guy goes down on the carriage floor, and the thug walks off very happy with himself. And I did nothing. The carriage was pretty full. But none of us did anything. It was terrible. It wasn't fight or flight, it was fight or sit there and watch. And I chose to sit there and watch. And I've replayed it many many times. I'm very unhappy that I did that, and I now have sort of resolved that if I see a similar kind of situation where I see someone being attacked like that, I will intervene with unmitigated ferocity. In some horrible way, I guess the fact that nobody did anything to stop this guy gives him permission to do that. That's the problem. He knows that he's on a train carriage, he's giving us a display of strength, and the only way we can get involved is if we better him. I was sitting there and I had a biography of Oscar Wilde and it's about 700 pages. I reckoned that this biography would have made a serious dent in his skull and also that it would have been a classy way to bring this guy down to the Tube floor, but of course as I have all these thoughts it's already too late. In fact the moment you think about it, it's too late. I hope times might be a-changing, and that if everyone had acted here it might have made a difference. I had an instance on the bus the other day when a passenger got on, and he was not of loutish aspect, I must admit, he was about 30, but he was causing the driver trouble. He was standing near the driver's window and the driver told him to move back and he refused. And the driver had to come out of his booth to point to the sign that says don't stand too near the driver's window. In the end the troublemaker moved to the back of the bus and I was the first person he saw. And he said to me: "Look I'm sorry as far as I was concerned I could stand there." And I said: "The bus driver is a public servant and this is his bus. Behave yourself." And as soon as I said that everybody else on the bus flew at the guy, including this old woman who started shouting: "Get off the bus now, you get off!" I thought: "Wow, everyone was ready to say something, but it was only because he caught my eye and I said something that everyone joined in. So you're looking in a way for that moment that gives everyone permission." The Jeremy Vine Show is on Radio Two each weekday at noon; he was speaking to Radio 4's Broadcasting House. I recently saw a woman being assaulted by a man well over twice her size at a bus stop in broad daylight. People rushed over to help (including myself and my girlfriend), but once over there we were stunned: what could we do? The man was huge. He appeared to be mentally unstable and so there was no talking too him. I went to try and pull him away, but he raised a fist - I stepped back, meanwhile my girlfriend did the same and he slapped her. This was enough of a distraction for the woman to get away, and then several men jumped on the man to restrain him. It took four or five men to keep him down. One thing I learned from that situation is you have to trust strangers: one person cannot stop a situation like this, you need others around you to all trust in one another to help stop what's going on. You all have to react as a community. It would be so easy to turn the tables on thuggish individuals, taking both of your examples - a crowded compartment/bus vs 1 individual or even more. If surrounded by passengers these individuals will become the intimidated. If he aims a blow, let the crowd aim a blow, if he threatens, let the crowd threaten - let's have many reports of upstanding citizens 'standing up' for themselves. There's strength in numbers - let's find our backbones and show some strength. Problem is, if you best the guy, the law punishes you. And if he beats you (and assuming you survive), nobody saw anything and the buffoon gets away with it. That's how the world works. I'd love nothing more than to beat the crap out of every thuggish, hooded yob, but of course I won't because I've been raised properly. And my wife won't let me. Well said, Jeremy. As an ex-police officer I feel that the various police services across The UK would generally support members of the public who are prepared to take appropriate action to intervene in potentially troublesome situations. That's certainly not vigilantism, it just means there are more decent-minded people around than thugs. If the vast majority of community-minded people (of all hues, religions and social-strata) refuse to leave unacceptable behaviour unchallenged then we can make a difference and work with the law enforcement services to keep our streets safer and more pleasant to live and move-around in. Jeremy Vine and his fellow passengers reacted in both instances in a cowardly manner. In the second anecdote, Jeremy was not being brave, he was just being sanctimonious. 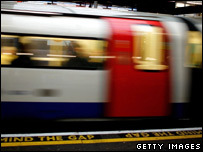 As a regular user of public transport in and around London I have witnessed many instances similar to that of Jeremy Vine. It is an incredibly difficult situation to find yourself in: Make a stand and die a hero or stand back and live with the consequences of your inaction for a long long time. I am constantly told by my wife to stay out of any situation but at the same time I would not want everyone to stand by if it were her being harassed on a tube or bus. In my opinion you should do all you can to keep the peace and make it clear that certain behaviour is unacceptable without being a vigilante and endangering your own life. If everyone said something then the anti-social idiots wouldn't do what they do. It's the knowing that nobody will do or say anything that encourages them to continue. This is especially prevalent in London where it would seem that even looking at someone makes people uncomfortable. Surely in the first example, the rudest act was the woman not replying to the man asking her to give a smile. If she had said "Sorry, I'm having a really bad day" that might have shut him up, or led to a brief conversation, but certainly not aggression and someone being assaulted. As someone who lives outside the city, it appals and angers me just how rude people can be when visiting London. It doesn't matter whether someone is of a different socio-economic background, political leaning or educational level, you can find something in common with everyone and maybe if you did, you wouldn't have to spend nights dreaming about clocking someone over the head with 700 pages of book. I expressed similar sentiments to yours, following a spate of vandalism in our street, to a 'Have Your Say' on the BBC news web site. The subject was CCTV vs privacy. I said I would not like a CCTV camera on my end of terrace - in spite of a good view of about 30 properties - because I wouldn't want to become the criminal when I caught the vandals in the act... There is a justifiable level of scepticism about the criminal justice system's ability to protect citizens who take action to protect others, themselves or their property. Bravado after the fact is common. Having been on the receiving end of a severe thumping, I understand you not stepping in, it's even less pleasant than watching it happen. A word of advise though, the oaf probably would have loved you to have a go with your book, which would have had little or no impact on a hollow object, but if you had succeeded in flooring him, I think it would have been best to manage it with a Thomas the tank engine book for irony. I believe I'd help out in a similar situation and have done in the past. The biggest fear I have is, if I do jump in to help another human being, if I happen to harm the attacker in my assistance, will I be jailed, in today's unreliable judicial system? Unprovoked attacks are very rarely that - unprovoked. Wrong as it was for your tube thug to lay into the guy who gave him two fingers, it was a provocation that caused the guy to get a kicking. What would the two fingers gesture achieve - absolutely nothing - bar the thug taking his attitude/frustration out on someone else, or in this case, the chap who dared gesture the thug. I'm not advocating the thug's actions, just pointing out that the attack was not unprovoked. The gesturer was not innocent, he was guilty of incitement of a clearly thuggish chap, which back-fired with awful consequences. By all means, step in when you see wrong doing, but don't incite or ridicule a wrong doer, it achieves nothing. I was involved in an incident in which a 17 year old youth was making comments about women in a petrol station, then squared up to me, threatening to knock me out, because I brushed against him ("touched" in his words) whilst getting a coffee from the station vending machine. I didn't know who he was, the entire petrol station was watching (and doing nothing except looking shocked), and in the heat of the moment I punched him. As well as breaking my knuckles and spraining my wrist, I also fractured his jaw. I could hear people making comments such as "nice one" and "he deserved that" as this youth floundered about on the floor in tears, and a few people did then help me restrain him, not that he needed much restraining by that point. The police were called, but when they turned up they charged me with GBH. Eventually I was let off, as CCTV evidence clearly showed the youth behaving threateningly, and the youth, who was known to police, was eventually convicted of affray. The two or three months following the incident were some of the most stressful I have ever experienced. I was suspended from work pending the investigation, the youth's lawyers did everything they could to make me appear like some kind of thug, and had I been convicted I was told by my lawyer that I could be jailed.